Super Hero Boy: Tropic Thunder on bluray! Heh. Tropic Thunder is still cracking me up. Watching it again in bluray is just even better. It's funny it still kills me how people either love or hate Ben Stiller movies. My parents, just do not get Ben Stiller's sense of humor and I get a lot of "That's just stupid!" out of them but I on the other hand love every second of it. You can read our full Tropic Thunder review and giveaway that we recently did here. Really the only part of the movie that still leaves me a little rattled is the Simple Jack skits, though I admit I laughed a few times it still leaves you with that feeling of "omg this is so wrong..." heh. Jack Black's performance is still my favorite in the movie though again I'm a huge Jack Black fan. Tropic Thunder in bluray is a whole other experience. The action scenes really start to shine, explosions, gunfire, you'd swear you were actually watching an action film, though believe me other than the cool explosion scene towards the front your not. Though seeing as this is a comedy and I'm sure they didn't have the budget of an action flick its still pretty impressive. The audio is just purely always better in bluray at least thus far in my experience. The bluray extras were really my only disappointment in the movie. Though there is plenty of extras and tons of extra commentary on the movie included in the bluray feature I just don't feel they really made use of some of the cool things you can do with a bluray player and the commentary is pretty lame as I'm just not huge on watching commentary bits at all. The deleted scenes were prol the best part of all of the extras as well as the "blowing stuff up" feature which was pretty cool. Overall though I would still end up getting the bluray edition as well with my hardwood floors and open floor plan non bluray features are just too hard to hear on my setup but without fail bluray seems to be loud and clear without having to turn the volume to full blast. 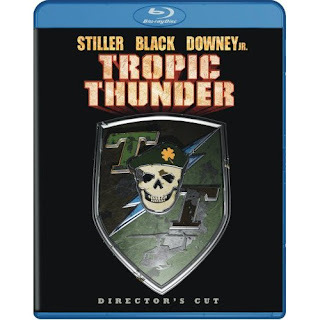 You can pick up your own copy of Tropic Thunder on bluray over at Amazon right now!